This Week in Data with Colin Charles 8: Percona Live Europe 2017 Is a Wrap! We’ve spent a lot of time in the last few months organizing Percona Live Europe Dublin. I want to thank all the speakers, sponsors and attendees for helping us to pull off yet another great event. While we’ll provide some perspectives, thoughts and feedback soon, all the early mornings, jam-packed meetings and the 4 am bedtimes means I’ll probably talk about this event in my next column! In the meantime, save the date for Percona Live Santa Clara, April 23-25 2018. The call for papers will open in October 2017. MariaDB 10.1.27. Percona XtraDB and TokuDB got updated from 5.6.37-82.2. Encryption gets tighter when it comes to temporary tables (fixes MDEV-12634). MySQL 8.0 is now a Release Candidate. You’ll want to read the highlights. As well as changes in replication. Percona XtraDB Cluster 5.7.19-29.22. New instrumentation to get a unified view of the cluster, new Percona XtraBackup support for encrypting data and backup threads. Why SQL is beating NoSQL, and what this means for the future of data – was SQL really being left for dead? It doesn’t feel like that to me, but this is an interesting read from our friends at TimeScale. It’s become unfashionable to talk about MariaDB MaxScale after the change to business source licensing, but after all this time (over a year now), there is a “list” of projects that use the BSL, including the ability to backup and restore MariaDB ColumnStore. Yahoo! makes Vespa open source. At Yahoo! this is the big data processing and serving engine. 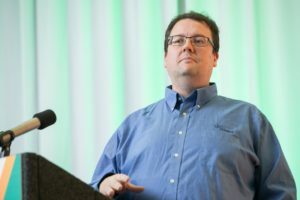 MariaDB ColumnStore engineer, Andrew Hutchings writes about Correcting MariaDB ColumnStore Benchmarks. “The moral of this story is don’t trust other people’s benchmarks.” I would like to see some MariaDB ColumnStore vs. ClickHouse benchmarks! 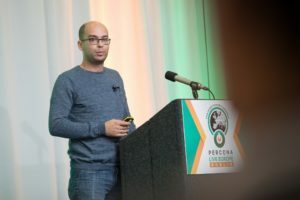 Migrating a database from InnoDB to MyRocks – Yoshinori Matsunobu, speaker at Percona Live Europe Dublin (and many other such events) and MyRocks hacker, tells us how they migrated Facebook’s UDB completely last month. The UDB maintains Facebook’s social graph, and they cut their storage usage in half! Also, “Finally, we will work to support MyRocks for the upcoming MySQL 8.0,” is very promising because this shows continued investment in MyRocks and MySQL by Facebook. Day one of the Percona Live Europe Conference was a huge hit. The first day of sessions went well. People spoke on many different open source database topics, and talks were well-attended. One such talk I got to sit in was on Spatial Data in MySQL 8.0, given by Norvald Ryeng of Oracle. MySQL 8.0 is still in development, but we already see a lot of improvement in GIS support. The latest development release comes with support for around 5000 different spatial reference systems, improved standard compliance and a lot of new functionality. How does it all work, and how can it be used to build applications? This talk started with the basics of GIS and spatial data in MySQL: geometries, data types, functions, storage and indexes. Then Norvald walked through a demo of how all the parts fit together to support a GIS web application. We also got a sneak peek into the future, including what to do right now to prepare for the upgrade to MySQL 8.0. Whether you’re currently storing or planning to store spatial data in MySQL, this talk was for you. It covers the topics in a way that is accessible to both novices and more advanced GIS users. 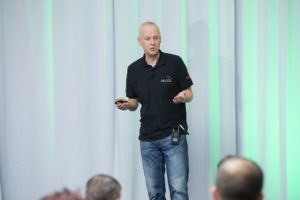 First up Geir Høydalsvik, Development Director for MySQL at Oracle, delivered juicy tidbits of what to expect in MySQL 8.0 (beyond what you see in the current Developer Milestone Releases). He gave a comprehensive overview of plans and current developments to what had become an almost full house – despite the night before’s revelries. MC Brown brought the conference up to date with the latest Tungsten developments, as well as some thoughts for the future. He described the wide-ranging deployments of Tungsten out in the field and his thoughts on how it might look going forward. 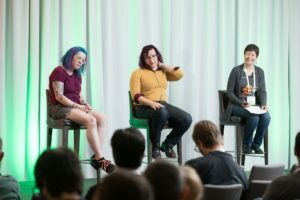 Laurie Coffin took to the stage to quiz Laine Campbell, Senior Director Production Engineering at OpsArtisan, and Charity Majors, CEO of Honeycomb Q&A about the newly released O’Reilly title: Database Reliability Engineering. The book focuses on designing and operating resilient database systems and uses open-source engines such as MySQL, PostgreSQL, MongoDB, and Cassandra as examples throughout. Pepper.com is purposely different than other platforms that list daily deals. Around the clock, the community seeks and finds the best offers in fashion, electronics, traveling and much more. Pavel described how Pepper optimizes their database performance to make sure their web applications remain responsive and meet users’ expectations.